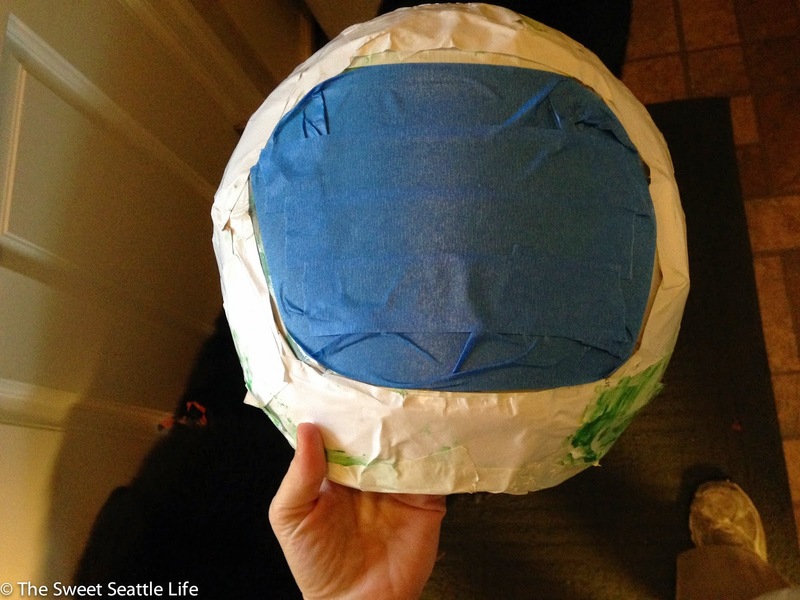 I’ve fielded a bunch of questions on constructing a space costume so here is a quick tutorial. We started with a ballon that was significantly larger than Ben’s head. Roomy is good! 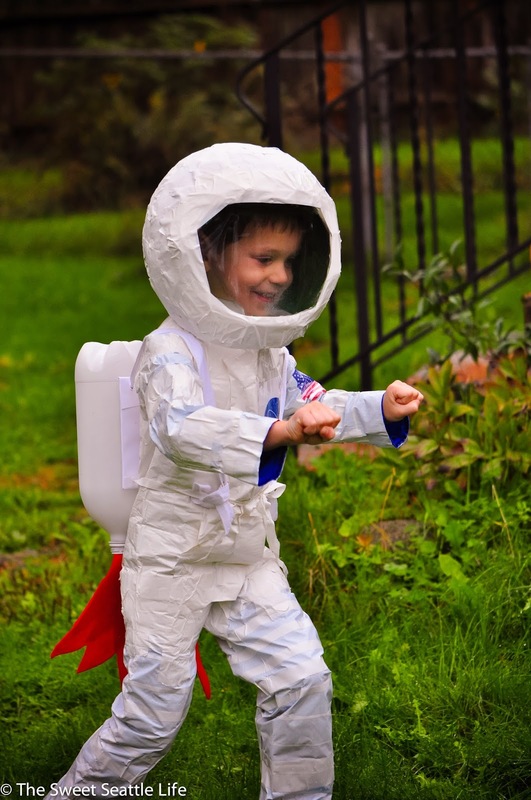 You don’t want a claustrophobic astronaut. Don’t worry that the balloon tapers down at the bottom; it’ll get cut off later in the process. We do a lot of paper mache in our house and this time around decided to use a flour paste (flour + water), instead of our typical glue paste (elmers glue + water). Don’t do it! Stick with glue. The flour was lumpy and smelled gross. Plus it took an extra long time to dry. Add enough water to your glue to make it moderately runny. I know that’s not terribly helpful but we never measure anymore. 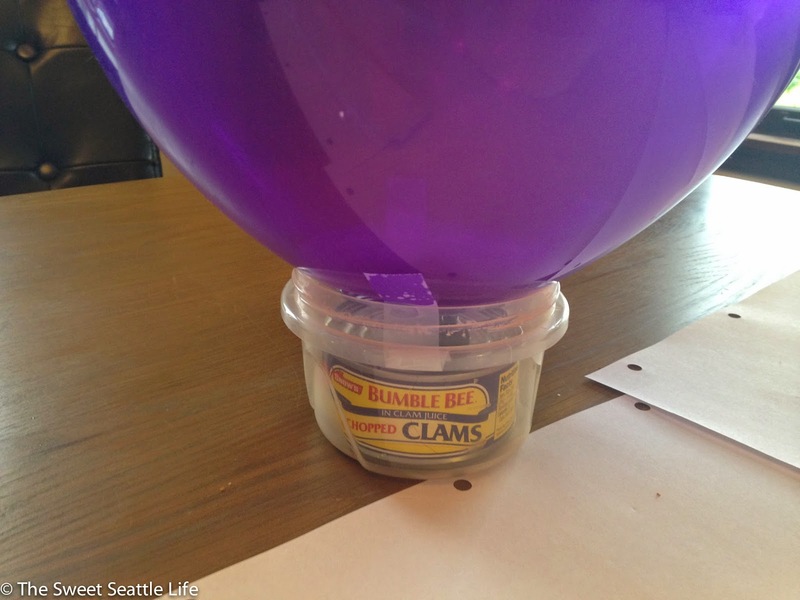 Before you begin pasting: tape your balloon down to a base (anchor). Make it as heavy as possible. Your balloon, once coated in paper and paste, is going to be quite top heavy and you’ll want a firm foundation. We used a few jars of clams and would have preferred a heavier base. With a sharpie, draw a basic outline of your visor area. Dip the paper strips in the paste, squeegee off the extra with your fingers, and slap onto the balloon. I start by placing the strips in slightly overlapping parallel strips and then lay the next layer perpendicular to the first layers. Make sure you have strong layers around the base (where the head hole will be) and around the visor. This is definitely the part where your kids can join in. 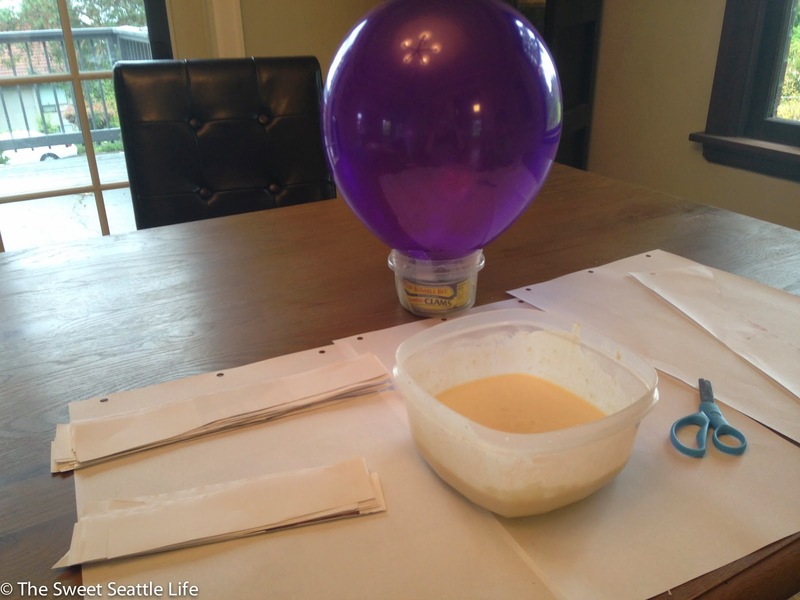 Mine loves the messy process; he’ll do the dipping and I’d place the strips on the balloon. It’ll look ugly and be a horrible mess but don’t lose faith! And now you have to wait for it to dry. Which can take days. We left it in a warm spot and forgot about it for a week. Not a project you can do the night before halloween. When it’s dry, enlarge the head hole with scissors. 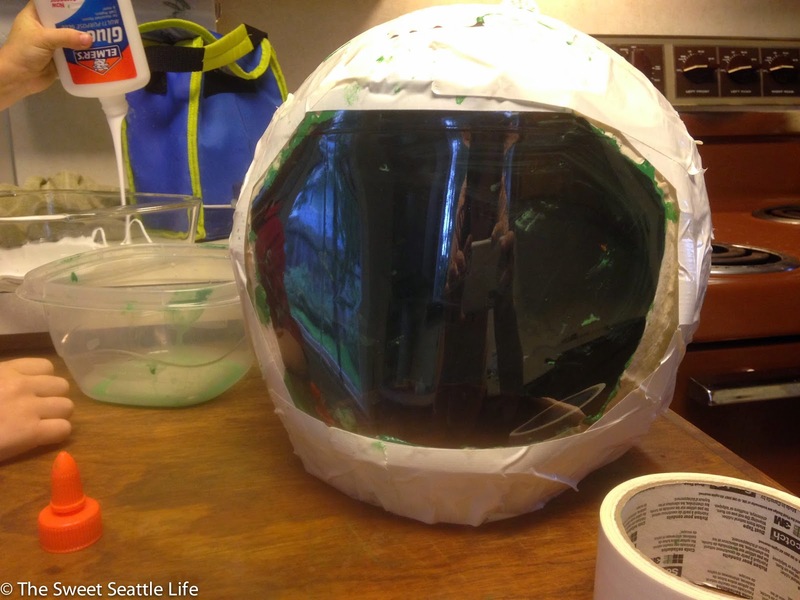 We also elected to paint the inside of our helmet (green) and to line the head opening with white duct tape so there were no rough edges that rested on the wearer’s shoulders. Cut your visor: empty the 2 L bottle and cut off the top and bottom, and then vertically so that it’s one big rectangle. Lay over your helmet. If you have white duct tape, it’s nice to tape it down, otherwise simply do more layers of paper and paste over the edges. Do several layers; you want the visor attachments to be sturdy. 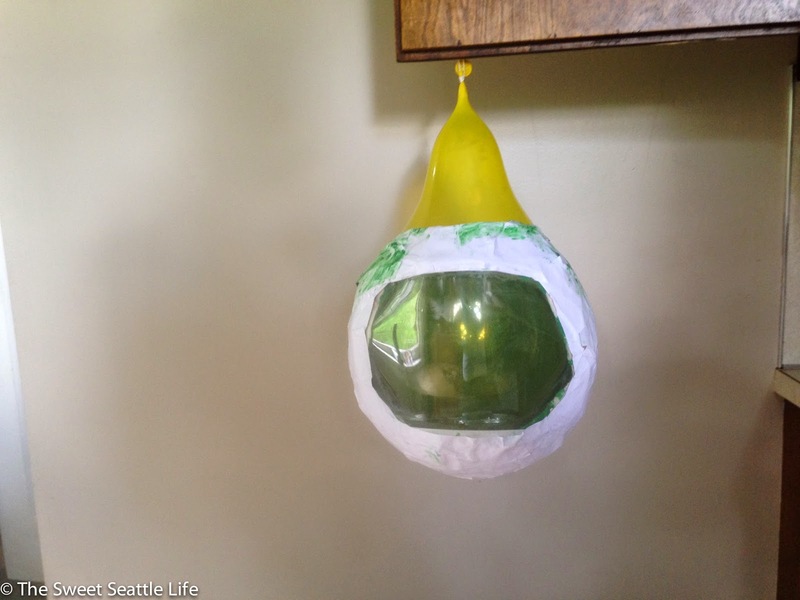 Blow up another balloon into the helmet and presto! A good way to dry your helmet. Again, forget about it for a few days while it dries. Last step: Use painter’s tape to cover the visor. 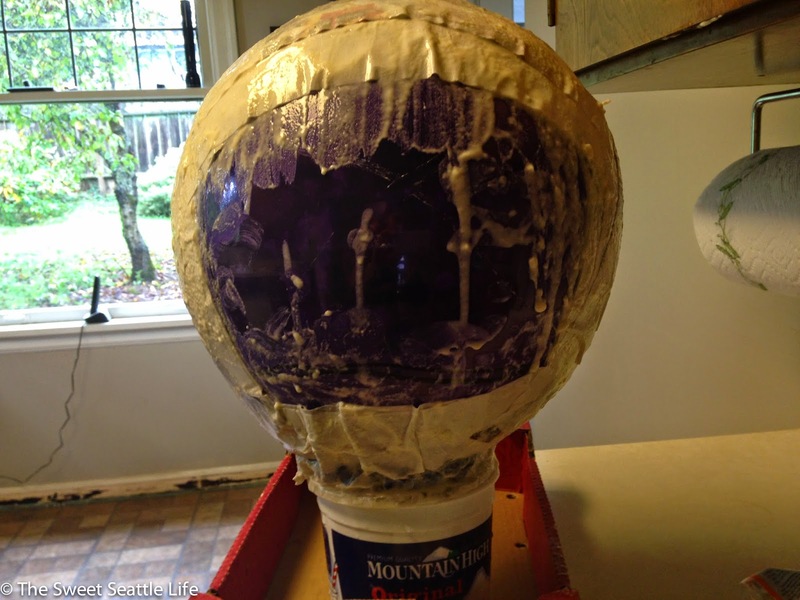 Spray paint the outside and add foam inside for a good fit. Again, we waited a week after this step to give the helmet plenty of time to off-gas... spray painting can be pretty fume-y. 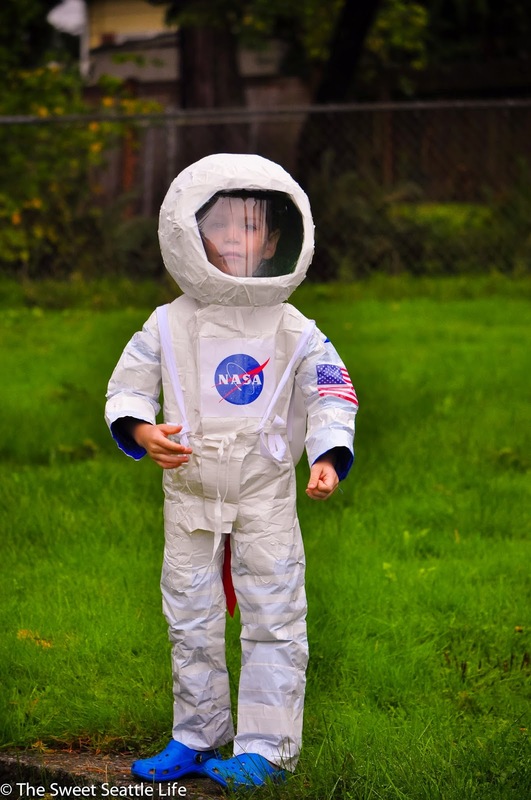 I was originally looking for a snow suit to use for the base of Ben’s space explorer costume but I could only find the bib style at our local thrift shop. The ideal garment would have both puffy arms and legs. 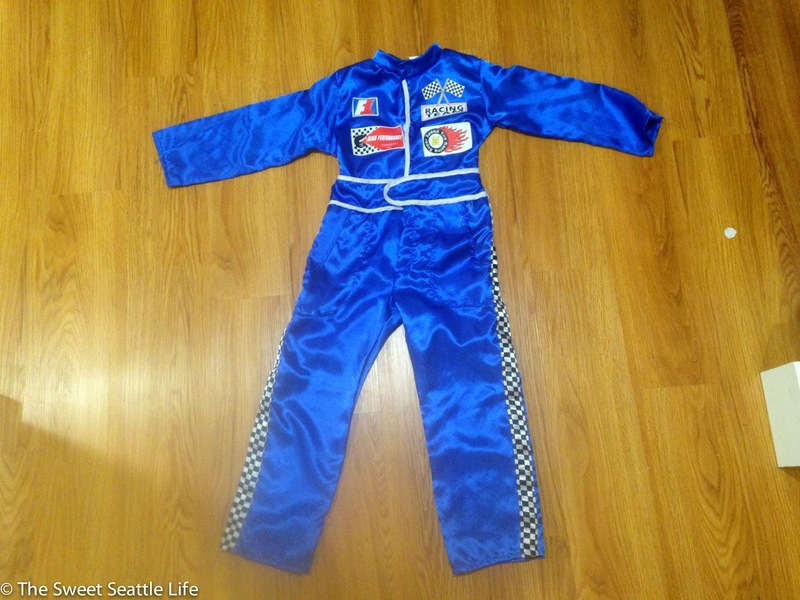 Instead we settled for a $4 race car driver suit. Important note: Buy up a size or two. The duct tape is quite restricting and the form-fitting suit required a little shimmy to get into, thanks to the constrictive nature of the tape. And after. The magic of white duct tape! 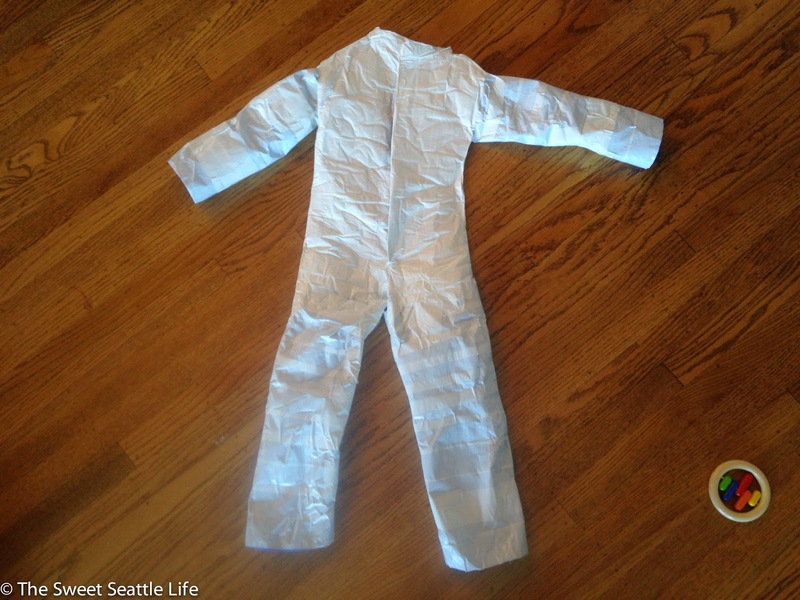 You could also cover ski gloves and boots in tape, if you’re really going all-out. 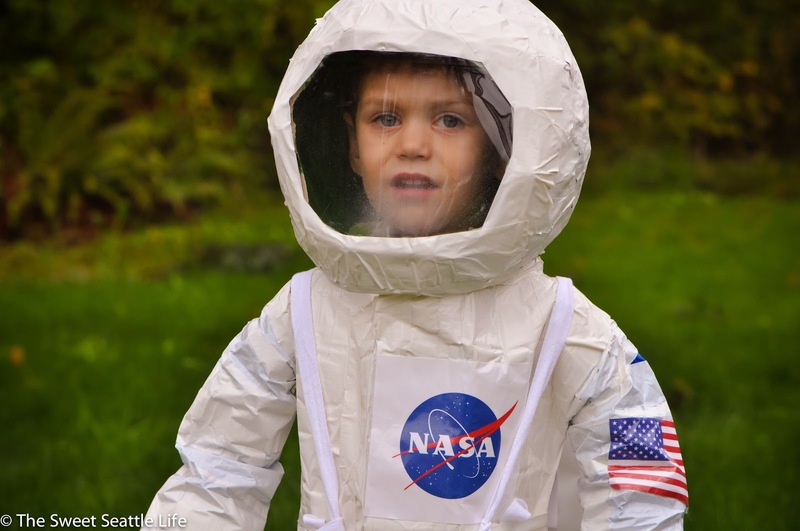 Finally, I printed off a NASA label and an American flag and used clear packing tape to attach them to the suit. I still can’t get over the fact that the root beer I bought was $0.78 for a 2L bottle. I pay $5.60 for a gallon of milk! We were sick of root beer by the time this project was over. Empty your bottles. Thread the ribbon through your flat piece of cardboard, making a harness that you can tie in the front. We did it from all four corners so a ribbon went under and over each arm. We simply tied all four ribbons in a big bow in front. A little goofy, but you could do it under the armpits if you’re particular. Glue your bottles side-by-side on the cardboard base. Use a fine sandpaper to slightly rough up the slippery plastic so the paint can adhere. Spray paint the whole shebang. 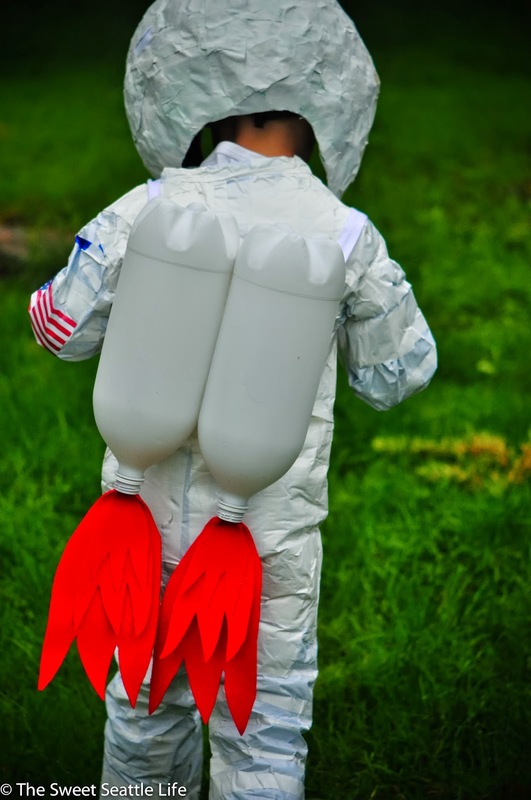 Cut out flames and glue them onto the bottom of the rockets.